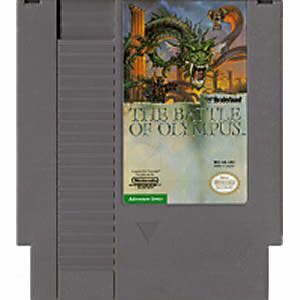 Battle of Olympus original NES Nintendo Game cartridge only - Cleaned Tested and Guaranteed to Work! when I first received the game ordered it didn't work.so then I contacted customer service and a replacement was sent.arrived and works beautifully.likie games great. Received the game in fantastic shape. Super game just as I remembered it, a real challenge to find where to go next but having fun playing this gem again years later. This is a very unique game. IF more nes games were built like this game, I would no longer be in college! I was a huge fan of Zelda 2 and now I see where it got it's influence from! 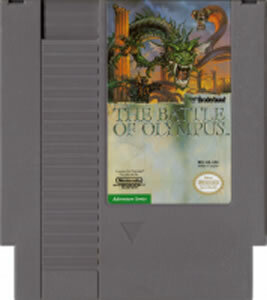 Battle of olympus has the same side-scrolling swordplay concept. I had some difficulty with it but I haven't played much of it. I just kept going right until I got killed by a giant bull, just to make sure the game worked. I plan on going back to this and it's probably one I'm going to have to put some time in. Zelda II this is not. I've been a fan of Greek myth and legend since grade school, but at the time I first played this game, courtesy of a friend of mine at that time, I didn't make the connection that that was where this game drew its plot from. I need hahrdly point out that whenI did finally make the conection I was delighted beyond telling. Battle of Olympus is a retelling of the classic, tragic tale of Orpheus, the minstrel, and Uridice, his love. While walking with her new husband in a forest in the evening, Uridice accidentally trod on a sleeping snake which bit her. She died from the poison. In grief, Orpheus traveled to Tartarus, the land of the dead, to entreat Hades to allow Uridice to return to the land of the living temporarily. Though touched by Orpheus' tale, which he told in the form of a song, the dour Hades nevertheless gave Orpheus a cruel condition for Uridice's return. She would follow behind Orpheus, as he journeyed back to Earth, but he could not look back at her unless and until both of them had set foot outside the bounds of Tartarus. Ultimately of course, Orpheus failed in this mission as Hades no doubt intended all along. The story goes on to say, however, that Orpheus lived a life of kindness and compassion, meaning that when his own time eventually came to die, he was finally reunited with his love. 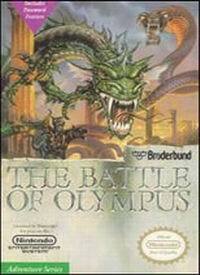 Battle of Olympus takes a different tack with the story. I don't know if this is a complete rewrite of the story or if this is Orpheus making a second, more forceful attempt to rescue Uridice, renamed Helene in the game due to memry limitations. Whatever the case you must explore eight distinct lands, collecting items and better weapons. In each of the seven main lands is a god or goddess who, some for free and some for a price, will give you items that will help you on your journey as well as advice on where you should go next. The eighth and final land is of course the underworld of Tartarus, where Hades stands as the final obstacle between you and the woman you love. Gameplay wise it combines Zelda II elements with Castlevania ones. You must run and jump through the various lands to find items while talking to townsfolk and gods to gain information. The game uses a password system rather than a battery backed save. After you talk to a god or goddess for the first time and obtain the reward for meeting them, speaking to them again will yield a password or "Word of the God." Each password will allow you to restart your game in the region where that god resides. This can be quite useful, since it also gives you a backup plan if you die. If you die and choose Continue, you'll lose half your olives, this game's currency, in the same way you lose half your gold in a Dragon Warrior game. Choosing Retry instead will start you at the last place you obtained a password, your olive count reset to whatever it was at the time you got that password. The controls are most like to the Castlevania games, right down to Up+B being the method for unleashing the special attacks of those weapons that have them. Then there's the Zelda II-ish pressing of select to use a special item, after first selecting it on the pause screen of course. Audio wise the game is something of a mixed bag. O all the tunes themselves are quite catchy, but the instrumentation of some, for lack of a better term, leaves a bit to be desired. For instance the theme for the caverns of Argolis does sound rather disturbingly like someone recorded a fart in midi format to add to the percussion section. Then there's the theme for Arcadia which, though quite good, is played at a high enough pitch that it can leave a painful ringing in your ears. The boss theme is also a bit too heavy on the percussion. I think my least favorite theme is that which plays when you finally reach Hades' temple after journeying through Tartarus itself. The main Tartarus theme is weird but ominously catchy. The temple theme for that region, however, is extremely chaotic and disorganized. Fortunately you're well compensated for suffering through it with a superb ending theme. Sound effect wise the game is nothing special. The effects work but they're not great. The only one I find truly annoying, and you will hear it quite a lot, is the grunt for when Orpheus takes damage. Others, like the sounds of the harp and ocarina (so that's where Zelda got the idea), are much better. All in all this is definitely a game worth owning if you can get your paws on a copy. I myself intend to buy one from Lukie as soon as possible to compensate myself for accidentally selling the copy I bought years ago. Guess it pays to go through your games more thoroughly to make sure you don't accidentally grab one you don't plan to part with.